Puri?? Really??! Deep frying with all that oil? 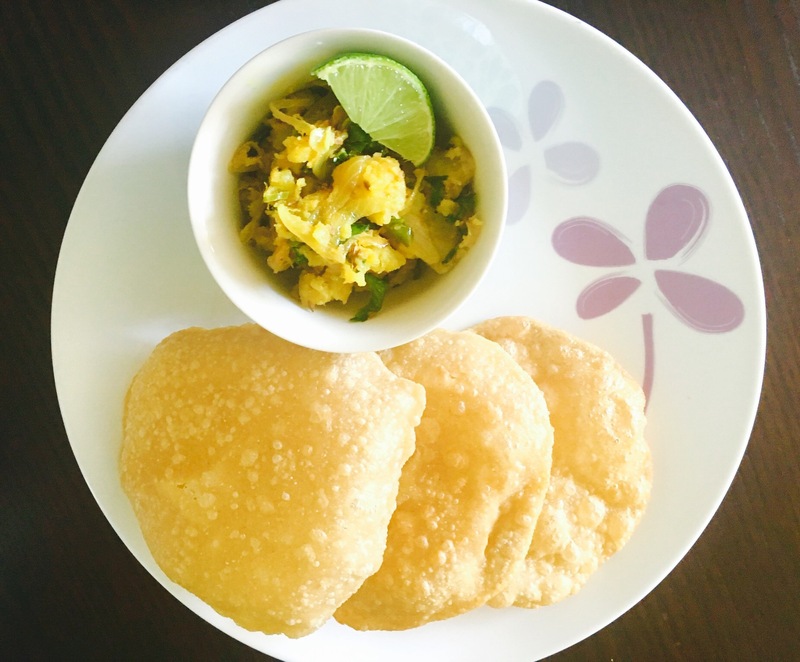 This is the question I ask myself every time I set out to make puris however after the first bite I know that all the effort was well worth it in the end!! This is one of those meals best cooked as a team – so if you have a partner, siblings, friends or family ask them to join along as cooking together can be more fun!! Start by mixing the dough for puris, add the whole wheat flour into a mixing bowl, add salt, semolina, 2 tbspoons of oil and mix using fingers. Then add some water – a little at a time and mix to form a dough. The consistency should be harder than your regular chappatti dough. Cover using a wet kitchen towel on top of the dough and set aside. This will avoid the dough from drying out. Next, roughly chop the potatoes into large pieces and boil in a container till cooked through. This may take 15 mins or so. While the potatoes boil away, finely chop the green chilli, grate ginger.Chop onions, long – julienne. Add all the spices – cumin, red chilli, coriander turmeric powders and mix. Allow to cook for another 2 minutes. Now, check if the potatoes are cooked. If so, then drain the hot water and rinse with cold water immediately to cool them down. Once cool, peel the skin off using your fingers and add to the wok & mix. Use a potato masher and roughly mash them. Season with salt. If you prefer it dry then leave it as is or if you like it slightly runny, then add in the yogurt and a little bit of water and mix. Cook for another 2 mins. Turn the heat off and squeeze lime, add chopped coriander leaves and set aside. To another hot wok add oil for deep-frying the puris, then section and cut the dough into small equal parts and roll out to smaller sized chappatis (Approx. half the size of your palm or so). Then once the oil is hot enough, deep fry the flat, rolled out puris separately. Cook puri till golden brown. Once cooked, allow to drain excess oil on a kitchen towel / paper. Tip: Adding semolina to your puri dough makes the puris puff up as you deep fry them and retain its puff while you serve them. You took me back to Mumbai! !